The past 48 hours have shown me something that I’ve never really taken the time to consider before. I’ve often be a procrastinator, I’ll make a decision one day and then the next think that it was the wrong decision; however I’ve recently considered that actually it may not have been wrong. We often naturally fear that we’ll make an incorrect decision when faced with a dilemma – but our fears are grounded in a misconception, which we all too frequently overlook: The world is not a constant landscape. Everything is fluidly in a state of change: the hands on the clock, the expressions on our faces, and the seconds of our lives remaining. In the past two minutes that I’ve been thinking about what to type, we have hurtled through space at the speed of approximately 460 metres per second. Just like me, nothing is as it were when you first started reading. A decision made now, may be what is best now, but tomorrow it may be not be. I made a big decision with my career to go from an operational clinical role to a managerial one. After a year and from my perspective, I decided that this decision wasn’t working and I wanted to revert to my previous role. So that’s exactly what I did. I was going through a lot of health issues at the time and now, after six months and an improvement in my mental wellbeing, I find that the decision I made back then was maybe right for me at the time I made it, but no longer the right decision for me now. So what does this mean? That we are doomed to make a string of wrong decisions? On the contrary. This realisation is what frees us from the fears of decision-making in the first place. 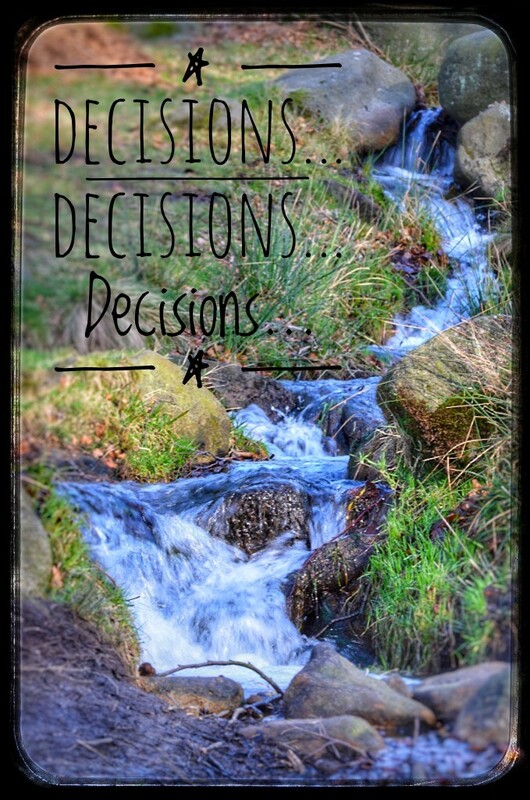 I was once told that when you make a decision, you should stick by it, right or wrong, but I think this only leads us down a rigid and anguished path. We have the right to change our minds second-by-second. If we make the right decision today but it proves to be the wrong decision tomorrow, we have the right and the ability to change it. Nothing is set in stone. Watch the rain running down a windowpane, or the water in a stream. When faced with an obstacle, it will change its direction to keep moving forwards. In our lives we find our paths often blocked by a consequence of the decisions we’ve previously made, but just like the rain or the river, in order to move forward, there is nothing wrong with a change of direction.